In the past 6 months, I’ve met with a lot of Canadian technology and digital media startups – either to interview them for a blog, chat with them at a conference , or figure out how I can help them with their B2B marketing or media sales strategy efforts. One of the most common questions I get from these meetings is “how can I grow my business/sales/traffic on a limited budget?” Besides the obvious tools and tactics that you might already know about (i.e. SEO, PPC advertising, blogs, social media, etc. ), there is one resource that I think that a lot of small Canadian digital media startups should be tapping into more often – each other. Perhaps it’s a little idealistic, but I do believe that the more we work together as small businesses, the more we will grow the opportunities for one another. Because I am constantly meeting with people, I often uncover ways that my colleagues and new connections might be able to help each other out. I get a lot of satisfaction out of making those introductions because they make a lot of strategic sense. Most small web-based businesses are in the same boat when it comes to growing on a limited budget. So, why not identify ways to partner with each other in order to tap into each other’s target customers (when they are complimentary) and strengths (when we can share insights, expertise or a service). Revenue Sharing or Affiliate programs: Since most small businesses have limited marketing budgets, why not negotiate with other small businesses to either do a revenue sharing or affiliate partnership (i.e. pay them a % commission) for driving sales to your site? Link sharing: Develop an agreement to share links and content from each others’ sites to drive-up SEO rankings. Guest blogs and product reviews: If another company knows a lot about a topic that is of interest to your target audience/customers, why not have them write a guest post on your blog and allow them to link it back to their site (negotiate so that you can do the same on their site). Or, have them write a review of your product on their website. E-mail lists: If you both have significant e-mail opt-in lists, why not do a barter to share a sponsored message to each others’ list with a special offer or promotion on your website? Social media: This one is simple, arrange to share links to each others’ site via your communities. Perhaps you can give away your partners’ product or a discount via your social networks. Events: If you’re hosting a customer event, invite your business partners to offer prizes or promotions at the event. 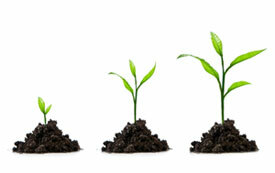 If you have other suggestions on ways that small businesses can help each other to grow, I’d love to hear about them. Hello my friend, your article on this page is really awsome. Its great material that you typed here. I can not wait to see more of this. Continue, what we read here is really a awsome page. Thank you, i bookmarked it and subscribed it on my RSSfeed reader. Next Social media: The soap opera of the digital age?